The art of phulkari has its origins in the early part of the 19th century when the odhini or head cloth was hoghlighted with embroidered flowers. 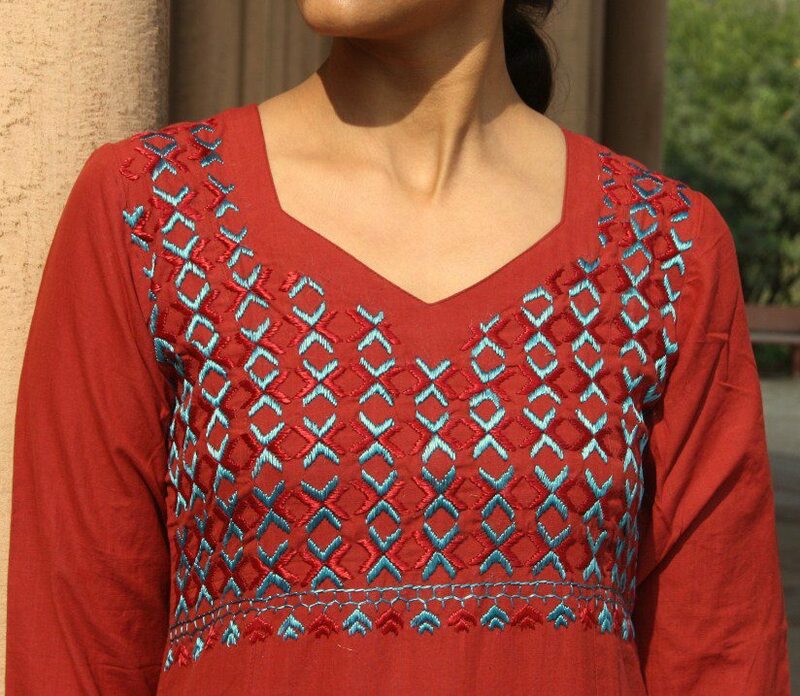 Phulkari, literally flower-crafting, comprises of the colourful embroidery that originates from Punjab. Over the years this embroidery became heavy and the work more complex and the heavily embroidered odhinis came to be known as bagh (literally garden). 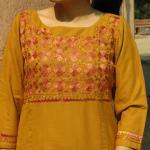 In this style the embroidery covered every inch of the entire base material so that the cloth was completely invisible. 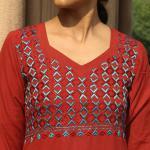 The darn stitch is used in Phulkari work while the base material for the embroidery has traditionally been hand-spun, hand-woven and natural dyed khadi. Colours like white, dark blue, black and brown were used for the base material but the preferred colour was red. 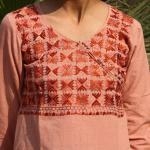 Imported floss silk yarn from China or Afganistan was used after locally dyeing. The embroidering is done from the reverse side of the fabric with the silk yarn which gives a shaded effect to the fabric. The uniqueness of this work is that the fabric itself is used as an inner decoration so that the pattern sewn on becomes an integrated combination of colours. 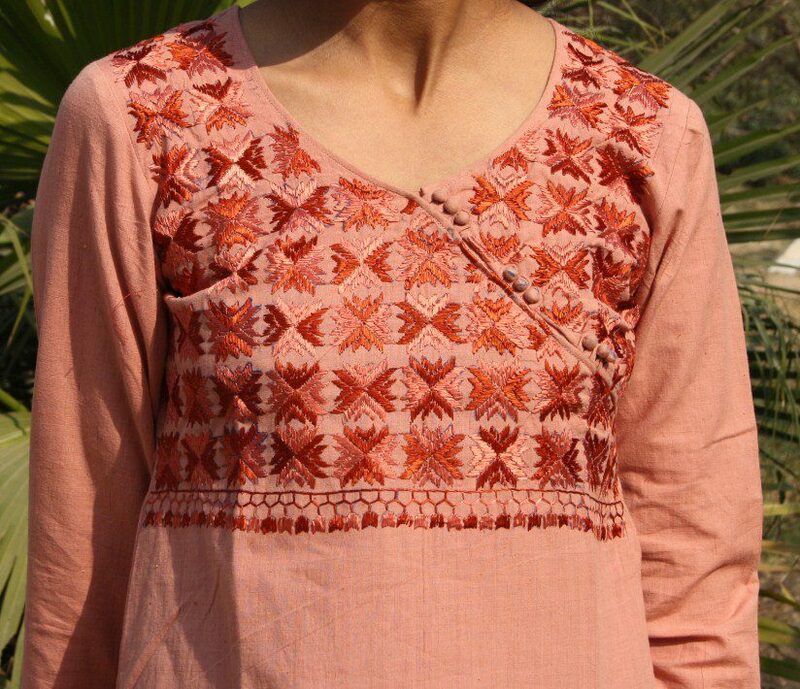 The smoothness on the reverse of the fabric speaks volumes of the quality of workmanship and skill of the embroider. The motifs used are karela bagh, gobhi bagh, dhaniya bagh and mirchi bagh are based on motifs inspired by vegetables while shalimar charbagh and chaurasia bagh are motifs based on the famed gardens. 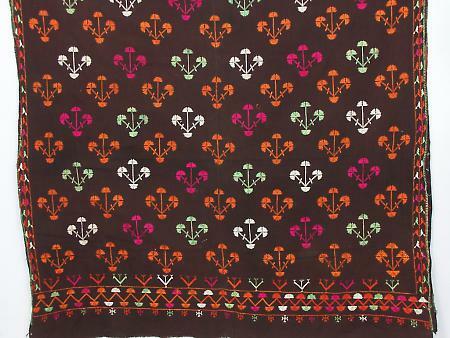 Satrangas are seven-coloured motifs and panchrangas are five-coloured motifs while the most common and beautiful motifs is based on the wheat and barley stalks that grow all over Punjab. In modern times this vibrant folk art of Punjab is now embroidered not only on odhinis but also on saris, bed covers and home furnishing in bright and vivid colours.